Some 400 years after refugees founded a monastery that would come to be known as Sancta Maria in Campo Marzio in a derelict area of the city, the monastic community they created had become an elite maker of the landscape of medieval Rome. Like other churches, monasteries and other religious foundations, Sancta Maria in Campo Marzio was a major property holder in Rome and its environs. A papal bull dated May 7, 1194 catalogs the monastery’s property located all over the city and beyond. Here I look to the period when the monastery was assembling its real estate portfolio to analyze how property documents inform us about the origins of this urban region, its social networks and its physical development. Landscapes are produced by the interaction of humans and the physical environment they inhabit. In Rome, property and the documentation of property holding was the medium of this interaction. Landscape formation is a continuous process of change driven by human deliberation. Charters are legal documents that record agreements concerning the ownership and the use of property. The transactions they describe took various forms: sales, leases, and gifts of property, among others. Charters also tell us about the people involved in these transactions and provide insight into the strategic planning that drove landscape formation. The first written reference to this monastic community dates to 806. The biography of Pope Leo III tells us that in that year he gave a gift to the oratorio (a chapel reserved for the use of a monastic community) of St. Gregory qui ponitur in Campo Marzio (located in Campo Marzio.) The original dedication of this community was to St. Gregory of Nazianzen. According to Roman legend, the origins of this community date several generations earlier than the time of this gift, to the pontificate of Pope Zachary (741-752). In this account, the community of nuns resident at the monastery of St. Anastasia left Constantinople for Rome as refugees during the initial period of iconoclasm, when the use of icons for devotional purposes was suppressed by imperial authorities. Later the name of Holy Virgin Mary was added to the dedication of the monastery along with Gregory, but by the eleventh century nearly all sources refer to this community as Sancta Maria in Campo Marzio. The physical environment for medieval Romans was the inherited landscape of ancient city, now largely ruins that were scavenged for materials or adapted to current needs. 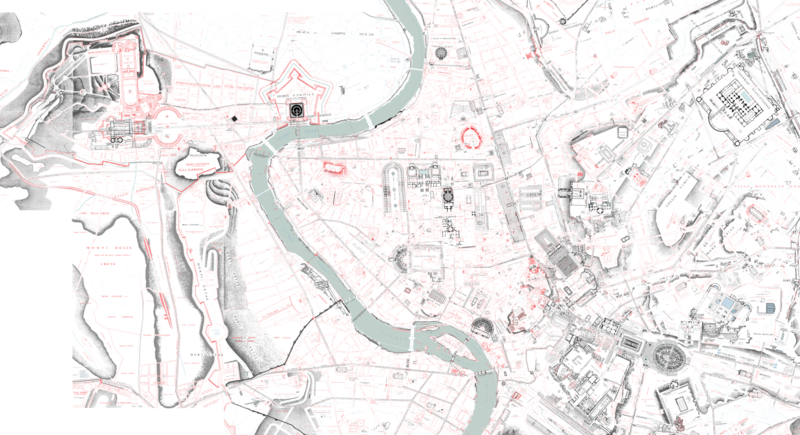 The core of medieval Rome developed within the bend of Tiber river, called Regio IX Campus Martius (Campo Marzio in Italian) in the ancient city. Historians divide this large area into three parts: the northern, central and southern Campus Marzio. In the medieval city, the term Campo Marzio refers only to the northern portion of this ancient region, and that name continues today for this area of the city. The rough boundaries of this region were the modern Piazza del Popolo to the north, the southern boundary being the line of straight streets that change name along their stretch (Via dei Cornari–Via Sant’Agostino–Via delle Coppelle), the Via Lata (the modern Corso) to the east, and the Tiber to the west. Ancient monuments filled the ancient Campo Marzio, and medieval charters make frequent reference to them as landmarks. The situation was a bit different in area around Sancta Maria in Campo Marzio. Monumental construction was less dense here than in other areas, and charters seldom refer to those known to be present. There is occasional reference to substructure of ancient buildings that are otherwise anonymous. That being said, some of the most famous Roman monuments were situated here, such as the Ara Pacis and column of Marcus Aurelius, among others. One wonders if some were already broken down beyond rehabilitation and in some cases buried by frequent river flooding in this area. The spread of residents across the city paralleled the dispersion of churches and other religious foundations held property inside and outside the city as an endowment. Before the tenth century, there were few churches there compared to other areas of the city. The relatively undeveloped character of the area is affirmed by the Einseideln itinerary, an early ninth-century catalogue of religious sites located throughout the city, doesn’t mention San Gregorius in Campo Martio or any other church in monastery in the area other than Sancta Maria’s neighbor San Lorenzo in Lucina. Although the monastery owned substantial property (75 houses in its own neighborhood by 1194), calling Sancta Maria in Campo Marzio a landscape creator is a bit misleading. The community was a property holder, but it did not develop property. That was left to the lay occupants – regular families who leased the monastery’s property or otherwise had the right to use it. The management of mutually beneficial relationships with local families was another method of landscape creation. Sancta Maria in Campo Marzio is not mentioned in many of the charters found in its archive. These charters document transactions that occurred before the monastery came to own a property. The retention of these older charters was done to affirm law title to a property once Sancta Maria in Campo Marzio did come to own it. Such documents taken also provide evidence for the relationship between the institution and local families. The urban development of the medieval city and development of family identity worked in tandem. Families defined themselves by means of property. Charters provide evidence for origin and development of families. Tracking the development over time is tricky. The history of a family within a kinship network is often hard to perceive, but by the eleventh century the use of surnames became more common, which suggests that a family identity had become stable. In these charters, families seem to appear all of a sudden and to vanish with the same abruptness. This is due in part to fragmentary nature of the evidence, but a family often passed into and from existence within couple of generations. The strategic deliberation that makes a family perceptible in charters takes different forms. Some examples can be found in several related charters in Sancta Maria’s archive. Let’s start on November 26, 1067, when a certain Peter, inlicito filio Ursoni presbiteri, with the consent of his wife Maria, sold a house with in courtyard in front of it and undeveloped land behind it to Iohannes qui vocatur de Bica (“who is called de Bica”). The seller Peter is described as the illegitimate son of a priest named Orso. The property came not from his family, but from his wife. The property sold in this transaction originally belonged to a certain Stephania de Crescentio de Iohannes, again here the use of several generations of given names of her father and grandfather operate as a rudimentary surname. The women have a lineage that Peter lacks. Marriage was his way into a legitimate family and status as a property holder. Witness lists provide equally valuable evidence for family origin and development. One such family is the Muti. In a charter dated November 26, 1067, Gregorio de li Muti was a witness to the sale of a house; this is the first reference to a member of that family. Other charters attest to the longevity of the family in this area of Rome. In a charter dated 1166, four generations later, two other members of this family, Antonio Romanuttii Muti is the buyer of a house and Romanus Romanutii Muti, likely his brother, is a witness to the sale. More telling are the names of the parties and witnesses to these transactions. The witness list includes men of other indeterminate status, from those known by a single name, Siginolfo, to Frago known by his profession faber, to Iohannem qui vocatur de Berizo and Barone qui vocatur de Adamo, who are known by rudimentary surnames derived from their fathers or another ancestor. In the later charter, all of parties to this transaction have formalized surnames. Let’s look at the witness list: Petrus Lucie, Iohannes Tebaldi, Iohannes Palera, and Phylippus Ortuni. The single of names, the use of professions to describe a witness, and the use of qualifying designations, e.g., qui vocatur …, are not present. It’s true that surnames were often derived from a male ancestor, but the change in form indicates a more substantial and recognized lineage. The experience of the Cerrotano provides another example of family development. On November 10, 1076, a woman named Bona made a gift of property – a tower that had been built over a substructure of an ancient building, to three of her siblings. This transaction seems little more than a straightforward act of familial benevolence. There was more to it than that. A closer reading of the evidence shows how charters articulated the relationship between notions of family and property in this area of Rome. Let’s first examine the people involved in this transaction, then we’ll examine property and the phenomenon of landscape formation. Although this property belonged to Bona, and the charters states the gift was made voluntarily and from love and devotion to family, it seems that her father, Romano Cerrotano, was behind the decision to make this transaction. Bona had received the property from late mother. Furthermore, the property was transferred to children Romano Cerrotano had with another woman. Romano is expanding his property holdings as a means to fortify a burgeoning family identity. In effect, the gift transferred the property from one family to another. The status of Bona is not stated. There is no reference to either of two conditions that could influence the treatment of property, the possibility of her being married or having entered religious life. We don’t know any more about her. Similar to witness lists, the description of neighbors provides evidence on family, landscape and social networks. Two neighboring properties are of special interest. The first belongs to Bona’s father Romano. The acquisition of this adjacent property was a strategic acquisition to enlarge his family’s holdings in this area of Rome. Also, the Frago who was a witness in 1067 appears again. In this case, he is a described as a neighbor to the property that is being transferred. Charters are full of people, and the same individuals appear again in different roles: party to a transaction, witness or neighbor, at various times. Romanus was the first of the Cerrotano documented by a charter. Like the Muti family, the Cerrotano developed a significant history in the Campo Marzio into the twelfth century and beyond. Members of this family appear in the charters of several archives, not just that of Sancta Maria in Campo Marzio. That being said, the family as property holder remains associated most with the Campo Marzio region. Further examples from the charters of Sancta Maria in Campo and from other archives can magnify the impressionistic presentation of evidence here. Each region of Rome had a unique trajectory of development based on numerous factors, the wealth of local institutions, the economic activity that occurred within its neighborhoods, the history of physical environment. For each region, charters provide evidence (some suggestive, some with solid detail) for variety of social phenomena that gave a sense of place to what otherwise might be perceived as inert urban space. Chris Petitt (M.Phil.—Medieval History) is preparing an anthology of eyewitness writing about Rome from antiquity to the present day. Contact him at chris_petitt@protonmail.com. Follow him on Twitter @petittcsr.